Corrugated plastic sheets (also known as Corrugated Plastic Cardboard, Coroplast sheets , Waterproof Cardboard , Corrugated Stratocore sheets) are 2 outside flat plastic sheets separated by small plastic beams running perpendicular to them. Manufactured from 100% virgin high-density corrugated polypropylene sheets, resulting in better quality , stronger, more durable, more vibrant colors than recycled\ partly recycled corrugated plastic sheets. Available in a variety of colors and all standard \ custom sizes. corrugated pp plastic sheets are the Ideal material for many industries including construction , signs, advertising, graphics display, screen printing, Packaging& shipping, Arts& crafts. At a weight of approximately 700 grams\Sq meter our corrugated plastic sheeting offer strength as well as light weight. Ideal for indoor and outdoor applications. tougher than corrugated cardboard ,fiberboard and lighter than extruded plastic . waterproof and stain-resistant. All of our corrugated plastic pads are electrostatically double treated by "Corona Discharge" on both sides to allow the best adhesion of inks and most adhesives, as well as U.V treated to provide an extra layer of resistance to the sun’s harmful rays. Excellent durability, versatility and reusability. 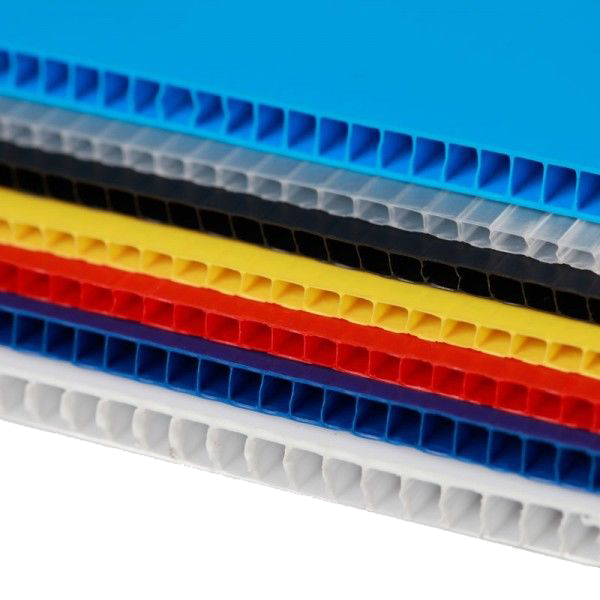 No other product offers the benefits of corrugated plastic boards as such a low price. Manufactured from 100% Virgin polypropylene plastic. Why settle for inferior (partly) recycled plastic, when our price is better? Brighter , more vibrant colors-Guaranteed to make an impression. Water \ grease\ dirt\ (most) chemicals resistant. Lightweight , yet stronger than corrugated cardboard\ fiberboard. Reusable. Can be used many times unlike most other materials. Can be printed on easily and clearly. Corona treated – to ensure better adhesion of ink, most adhesives. U.V treated- Better longevity outdoors. Large stock of standard sizes+ Any custom size can be made in 1-3 days. Won't rust, rot, mildew or corrode. Can be scored, creased, stapled, nailed, stitched, folded & drilled. Suitable for: Adhesive vinyl application, die cut, sonic & heat welding. Environmentally friendly- can be recycled. Flutes run parallel to the length.